While we recommend using Beaver Builder page builder and offer full integration with the plugin, the theme works perfectly fine with any decently coded page builder plugin. Modern is an accessibility ready blog and portfolio WordPress theme, perfect for personal portfolios. Optimized for search engines, with responsive design, ready for mobile devices and high-resolution displays. Built using secure, speed-optimized, translation-ready code with support for multilingual setup (including RTL languages) and featured posts slideshow on front page. Huge focus was put into readability, putting your website content in front. Compatible with Jetpack plugin and any page builder plugin! The homepage features your latest blog posts section, portfolio section and testimonials section. All of these sections can be customized, switched off or reordered to your liking. All of the customization options for the theme are built into the WordPress’ native customizer. It is easy to use and fast to customize to your needs. Modern offers unique styles for each of WordPress’ default post formats. In style guide page you can see how the HTML elements are styled, including code formatting, blockquotes, lists, table styles, highlighted text style, image alignment, Jetpack Tiled galleries and more. The theme even adds a custom styles to the post editor to allow beautiful, yet accessible post content formatting. Do you find your page or post content layout still a bit boring? Don’t worry, you can use any page builder with this theme to create your custom layouts. With true one click demo content installation process it is very easy to start your own website with predefined layouts from theme demo website. Or you can simply use the theme starter content for fast small website creation. The theme was reviewed by popular online WordPress magazine WP Tavern. You’re invited to read the review article. 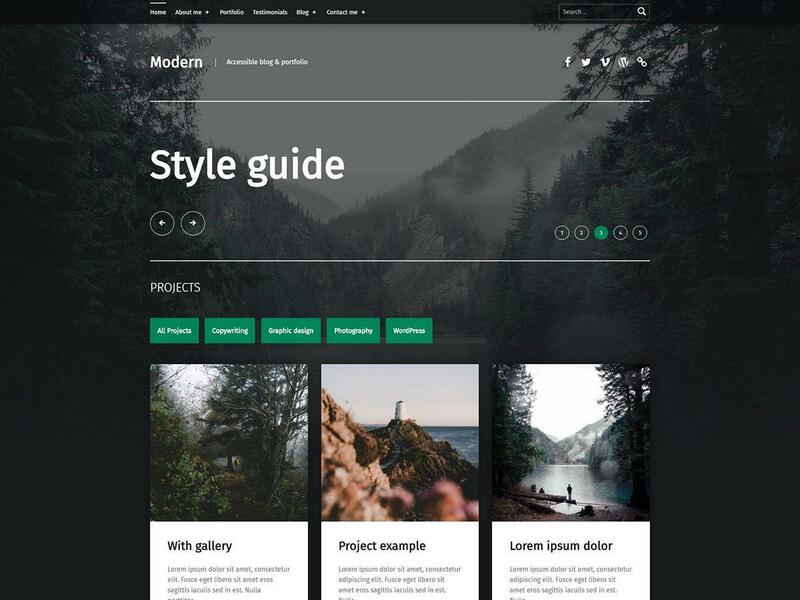 Modern is a popular and well rated free WordPress theme. As this free theme is distributed via WordPress.org official themes repository, you can install it directly from your WordPress dashboard. Just search for “Modern” in Appearance » Themes » Add New.